Crates are unique among packaging types, owing to factors related to materials, construction, loading, logistics, and unloading. Even when a crate is said to have been built in accordance with a national specification or an industry standard, the aforementioned factors combine for particularity. Besides, the majority of crates are designed by the shipper or by a supplier, with varying regard to a national specification or an industry standard, further contributing to the uniqueness of every crate. As such, whether the crate litigation alleges personal injury or cargo lost, the right packaging expert is one who brings the expertise and experience necessary to: understand the attorney's theory of the facts; educate and advise the attorney in the many intricacies; and, analyze, opine, and communicate with uncompromised honesty and professionalism. The term, crate, denotes a package constructed of wood, having a base, front, back, ends, and top, assembled in a design ranging from openlattice to fully-sheathed. A crate is distinguishable from a wood box in several ways, but to simplify, a crate derives its strength mostly from its corners and diagonals and has one or more features designed for mechanical handling. At any given time, there are untold millions of crates in the global commercial stream of commerce, making it inevitable that, from time to time, allegations will arise regarding a crate's fitness for intended use. When allegations result in litigation, the underlying facts usually involve a personal injury (even death) or damaged cargo. Injury and damage are foreseeable consequences when matters go wrong with crates. A loaded crate, by virtue of size and weight, has an inherent potential to inflict harm. Furthermore, the cargo inside a crate is typically of a value or quantity, from which, damage can tally a substantial sum. The two consequences can be sequential; for example, when a compromised crate with concealed cargo damage is later involved in an injury. Alleging a theory or defending against same in any litigation involving a crate can be problematic, and attorneys should acquaint themselves with the reasons. Chief among them is the fundamental fact that crates are constructed, that is to say, built, as opposed to the mass-production associated with bottles, cans, cartons, bags, etc. - types of packaging within which one exemplar is likely to be indistinguishable from another. 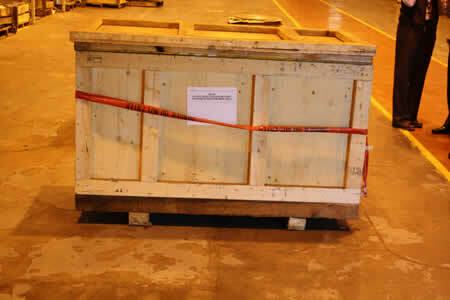 Determining whether a crate was unreasonably dangerous or defective, and if so, whether by a design defect or by a manufacturing defect, is seldom straight forward. Even two crates built from the same specification can be meaningfully different, due to factors such as the quality of wood and the method of assembly. Sometimes, only photos are available, because the actual crate has been scrapped. On the other hand, when the involved crate is available, it's not unusual for that crate to have been damaged, either by an untoward incident or by having been opened. Consequently, an on-site inspection, if not conducted exactingly, likely will overlook pertinent information, resulting in a waste of time and expenses. The determination of whether there has been a breach of reasonable care is multifaceted. As already alluded to, customization is the norm in crate design; therefore, invoking a relevant standard (or portion thereof) requires knowledge of?among other things?good manufacturing practices and safe operational practices, in order to allege what a defendant knew, or should have known. Complicating matters further is that breach of care is not limited to crate construction; it can extend to attending activities that can affect the safety of personnel and cargo. Those conditions include: loading contents into the crate; loading the crate into a transportation vehicle/vessel; storing the crate; opening the crate; and, all the handling methods associated with each. Determining whether a warning was warranted in regard to a crate requires delving beyond hazards that are inherent with any large, heavy object, hazards subject to an open-and-obvious argument. Then again, that an unfortunate incident occurred, is not proof, in and of itself, of a need for a warning. More is required for that determination. The association between hazards and warnings is affected by a variety of factors, some product-specific, some industry-specific, still others incident-specific. In some cases, there is a warning, but it doesn't address the involved hazard(s), necessitating a determination of how probable and foreseeable were the events at issue. And, in cases wherein the warning does address the involved hazard(s), it may be necessary to determine its adequacy, for example, whether the warning was of the proper content and format. "Alleging a theory or defending against same in any litigation involving a crate can be problematic, and attorneys should acquaint themselves with the reasons." By virtue of all of the preceding reasons, plus others that can't fit within the length of this paper, attorneys in cases involving crates need a packaging expert of a specific profile. The expert should know crates, not only from a theoretical perspective, but also from a practical one, gained from actual experience. Moreover, the expert should be able to evidence that dual-command during the initial contact with the attorney. The right expert will prove to be a valuable asset to the attorney's team. That role is maximized the sooner the expert is brought on board; however, regardless of the time of entrance, the expert should know how to "hit the ground running." A big part of that is not having to research (and bill for) aspects that a more experienced and more knowledgeable expert already would know. Beyond the duties of analyzing, opining, and communicating, the expert should serve in an advisory capacity. Throughout discovery, the right expert can advise as to: questions for deponents; interrogatories; requests for production; etc. And, always valuable is the ability to advise from the viewpoint of the opposing side. The right expert can be of service even before litigation starts, to a plaintiff's attorney wishing to assess the advisability of filing a suit. Similarly, upon receipt of a Complaint, a defendant's attorney could benefit by consulting with an expert to assess the advisability of contesting vs. a settlement. In any event, the right expert will continuously strive to deliver, up until the case is officially closed and the final invoice is rendered. "The right expert will prove to be a valuable asset to the attorney's team." Download PDF copy of this article. Sterling Anthony specializes in product liability/personal injury involving packaging, labeling, and warnings. His 30-plus years of experience were gained through careers in industry, academia, and consulting. Expertise covers consumer and industrial goods. Credits include many publications and speaking engagements. See Mr. Anthony's Profile on Experts.com.